Sherbert was an orange tabby. We adopted him at 3 months. Sherbert was the most gentle, patient kitty. Such a great temperament. When he was 10 years old, he developed diabetes. We were giving him insulin. He survived that for 2 and 1/2 years. He then developed a tumor in his tummy. He had surgery for it last November but never really recovered from it. He lost his battle in March of this year. He is now in a matching urn of his brother, and shares the same shelf in our cabinet. 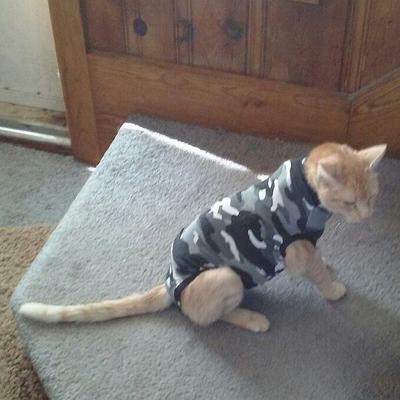 So sorry for your loss he looked so sweet, loved his little sweater.R.I.P. Sherbert. I'm so sorry for your loss! Loosing a part of your family really hurts even if it is a furbaby! I had diabetes for 50 yrs. and I know the problems one can have from this horrible condition, I can only imagine it would be worse for an animal since they can't tell you that their sugar levels are too low or too high so that you can adjust either their food intake or their insulin to get them back on track. I pray that the Lord will send you another special kitty or two into your life and home when the time is right for you. RIP Sweet Little Sherbert. You were loved so very much, I'm sure you're happy and running free with all of the other beautiful souls on the other side of the Rainbow Bridge! !